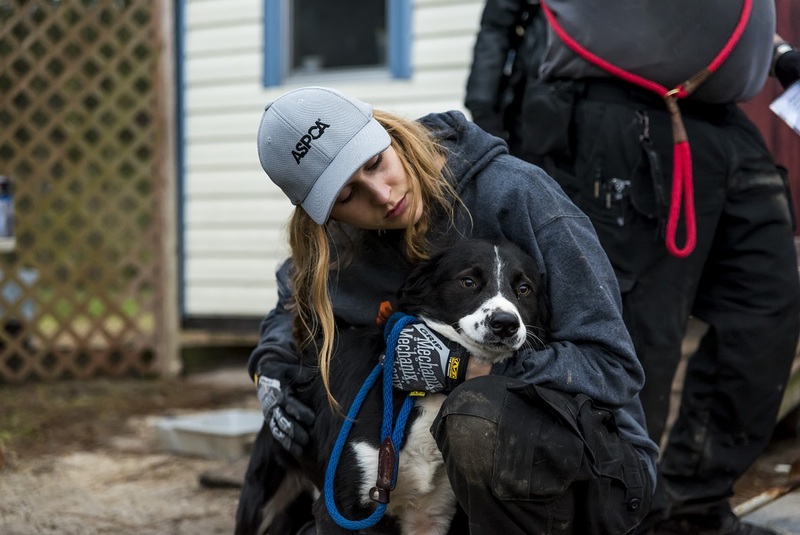 Hayley Smith was on her first-ever deployment to help rescue animals from an unlicensed animal sanctuary in North Carolina when she noticed the Border Collie in a rusty cage near the back of a small, windowless building. In the nearly pitch black darkness, Hayley remembers cats and dogs, stacked in cages, meowing and crying. The acrid stench of feces and urine overwhelmed her. Hayley with Clover, now named Haggis, on the day of his rescue. Over the next few days, nearly 700 animals, including dogs, cats, horses and pigs, would be rescued from the sprawling 122-acre property known as “The Haven,” making it the largest companion animal rescue in the entire 150-year history of the ASPCA. Over the next six weeks, Clover and the other animals would be cared for in temporary shelters by more than 600 responders from 56 animal welfare agencies around the country. Once the ASPCA was awarded custody of the animals, plans for an adoption event got underway. Clover’s lucky day came on March 18, when Scott Harris and Bonnye Talbot of Raleigh, North Carolina, who had been following the story in the media, decided to adopt a third dog. The couple waited more than two hours in the line outside a warehouse in Sanford, North Carolina, in shorts and T-shirts, with hundreds of other families hoping to find a new family member. Scott and Bonnye meet Haggis for the very first time. “We were surprised that no one had adopted him by the time we got in,” says Bonnye, who said the couple wanted a medium-size, high-energy dog that would get along with their other dogs, a senior Dachshund named Sweet Potato (Tater for short) and a two-year-old Corgi named Wilbur. 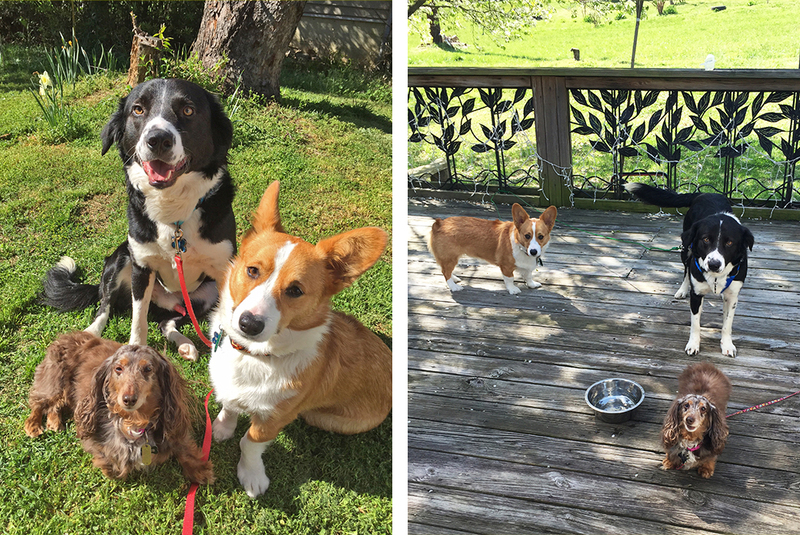 Once home, Wilbur and Tater welcomed Clover right away, chasing, playing, and napping together on their first night. Haggis with his new siblings, Sweet Potato and Wilbur. While many animals of The Haven’s animals suffered from untreated medical issues—some severe—Clover’s were related to dry, itchy skin. He was also underweight. After two weeks in his new home, his fur fell out, but baths and rub-downs with coconut oil—which he still gets once a month—ensured his hair soon grew back, curly and soft. He also gained 24 lbs. and today is a healthy 67. He also has a new name: Haggis, a nod to the Scottish heritage of his breed. Another thing Haggis loves is backpacking. Bonnye, who trains acrobats and trapeze artists (among other aerial performance/circus skills), is an avid backpacker, and gradually introduced Haggis to the activity. By October of last year, after a two-day trip with a golden retriever named Rosy—a retired therapy dog—Haggis proved he could carry his own gear and go as far as 20 miles in one day (without gear). Now the pair aim to complete the second half of the Appalachian Trail, a 2,200-mile stretch from Georgia to Maine. 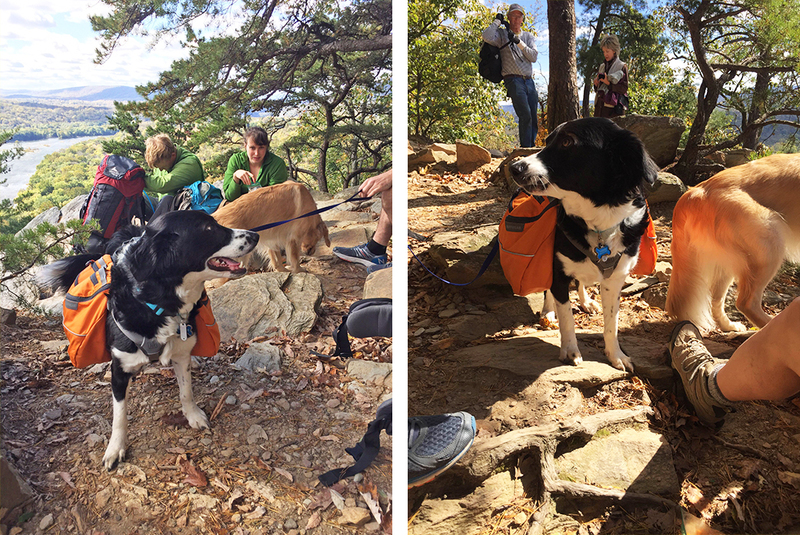 Haggis loves backpacking and is currently preparing to join his family on the Appalachian Trail. 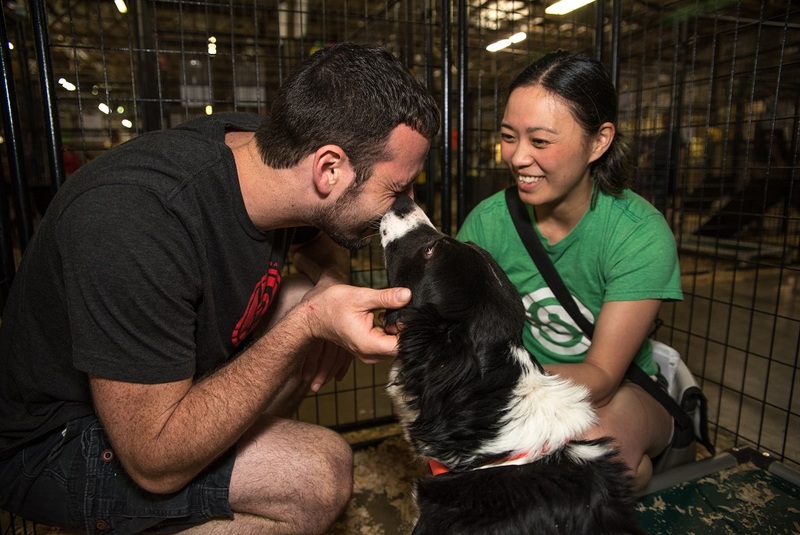 Bonnye and Scott, who met in a self-defense class (Scott was her instructor), have always had soft spots for rescued animals (Tater came from a North Carolina puppy mill). While in the midst of planning their June wedding, the couple celebrated a “Haggis-versary,” the first anniversary of Haggis’ adoption, cooking him a veterinarian-approved meal of his favorite foods: baked chicken, sweet potato and green beans. 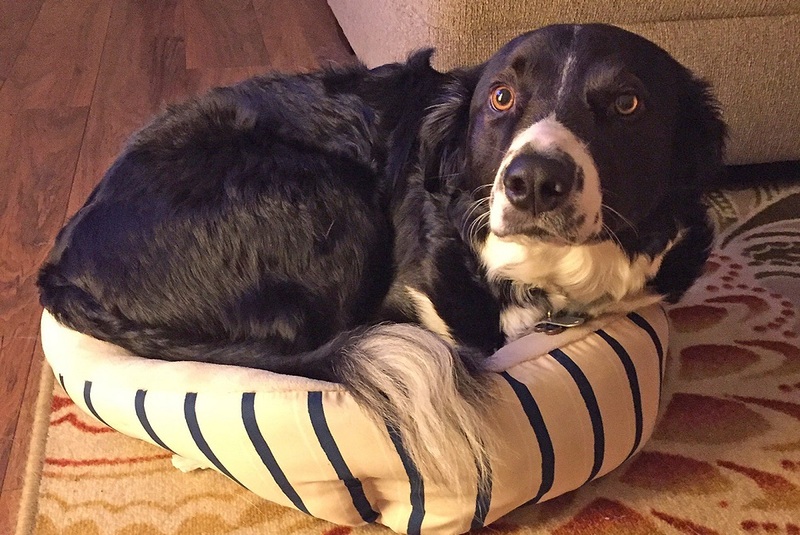 “He was in heaven,” said Bonnye, acknowledging that their other dogs get their favorites dishes on their adoption anniversaries—and all share in the bounty. And next up for Haggis: dock diving.